Help to keep your kids scrape and bruise free with KidWise Fanny Pads! Fanny Pads are rubber safety mats designed to help keep your kids safe on the playground! These rubber safety pads are a great way to protect areas that suffer wear from playground traffic in order keep your play area beautiful and safe. 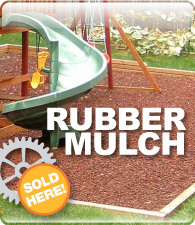 Our KidWise Wear Pads are made of recycled rubber and are 38"L x 23"W x 1.37"H. The Newly designed Fanny Pad has built in cushioning under the pad to provide additional protection and help hold tight in mulch or on any other surface. Place under swings, slides, or any place foot traffic will wear away protective safety surfaces. These 1.37 inch pads offer greater wear and safety protection as compared to other imitation wear pads on the market. These safety pads ship in packs of two with Free Shipping in the Continental US. Now offered in Brick Red, Grass Green, and Blue. Help to keep your kids scrape and bruise free with KidWise Fanny Pads! Fanny Pads are rubber safety mats designed to help keep your kids safe on the playground! These rubber safety pads are a great way to protect areas that suffer wear from playground traffic and keep your play area beautiful and safe. KidWise Wear Pads are made of recycled rubber and are 23"W x 38"L x 1.5"H.